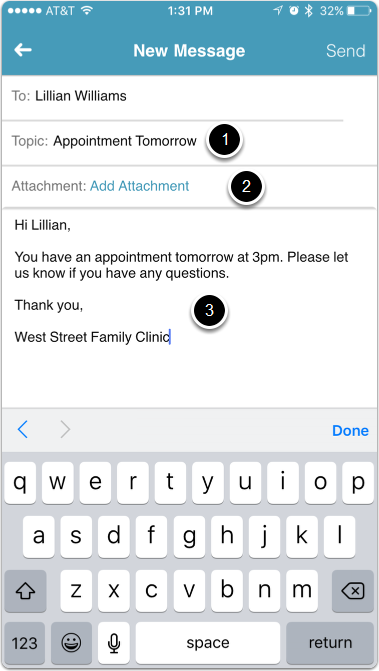 In order to view the clinics myHEALTHware Conversations inbox, the clinic staff member will need to modify the "Acting As" designation for the myHEALTHware mobile app. To modify this, tap on Settings or tap on "Acting As" at the top of the screen. 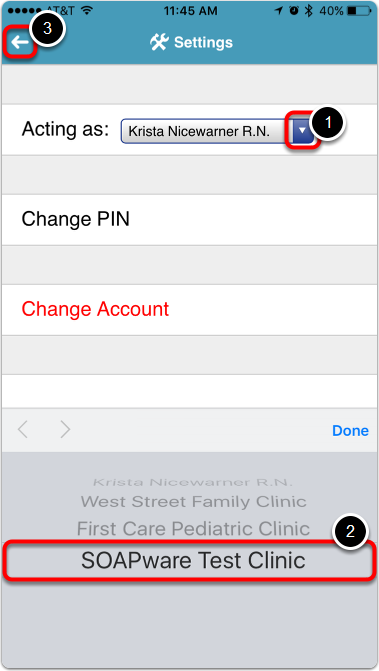 Using the drop-down menu, select the appropriate clinic, then click the back arrow to apply your settings. The contents of the conversation inbox will be displayed. To view or reply to a conversation, tap the conversation. Conversation Content: The content of the conversation will be displayed at the top of the screen. Date/Time Stamp: The date and time that the message was last updated will be displayed to the right of the message topic. Attachments: To view any attached documents, tap on the desired attachment to open it. Reply: To reply to the conversation, enter your message into the box at the bottom of the screen, then click Send. 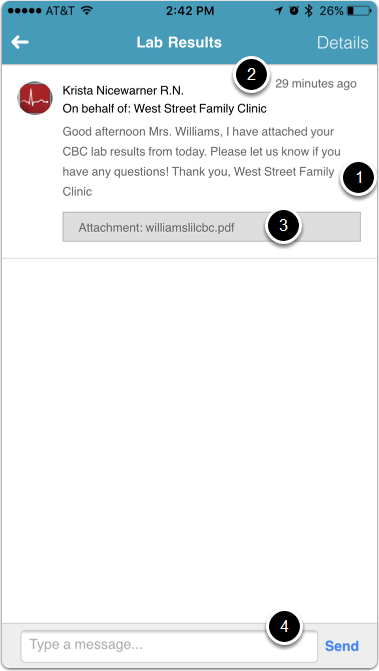 Above is an example of an an attachment that is being viewed on an iPhone. You can zoom in on the attachment to enlarge the image. Click Done to return to the conversation. 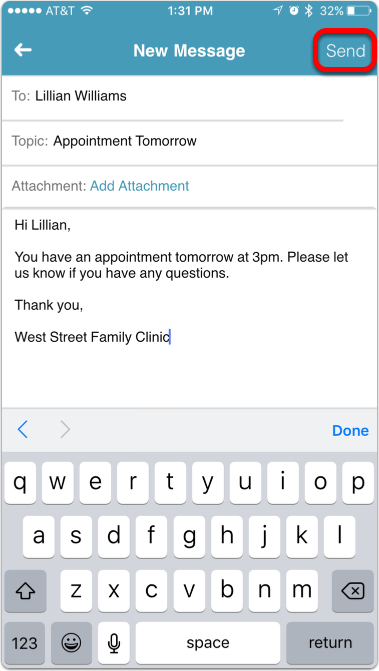 To view the details of a message, click the Details button that is located in the top right corner. A list of all members who are currently a part of the conversation. To leave the conversation, you can tap the Leave this Conversation button. This will remove you from the conversation and you will not receive any new messages. Tap the Hide button to return to the previous screen. 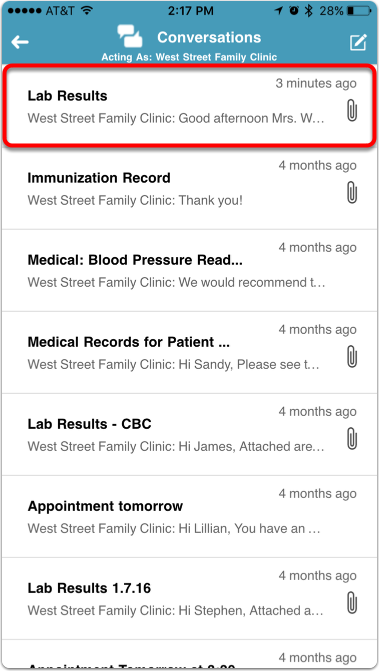 To start a new conversation in the myHEALTHware app, return to the Conversations inbox and tap the New Message button. 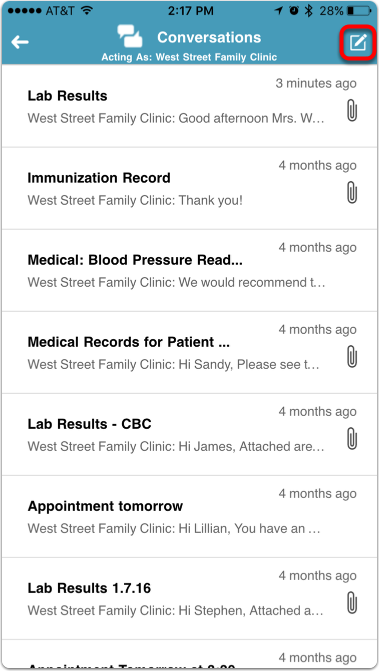 Tap the To: line to search your list of myHEALTHware contacts. 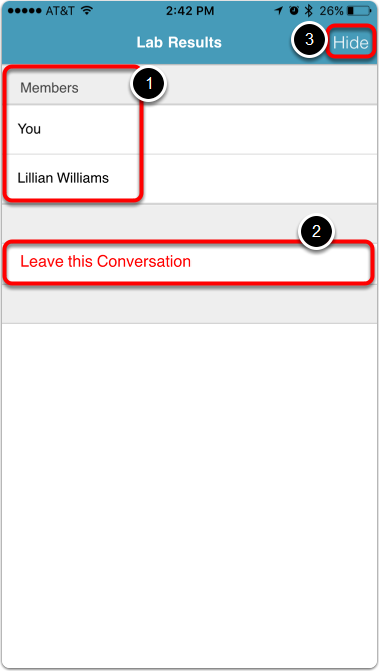 In the Search box, enter the name (or part of the name) of the contact you wish to send a message to. 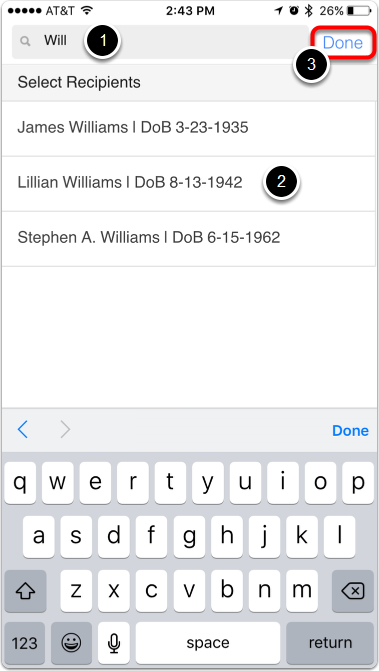 In the Select Recipients ares, tap on the desired contact/patient. Click Done to return to the new message screen. Click Add Attachment if you wish to include an attachment on the message. 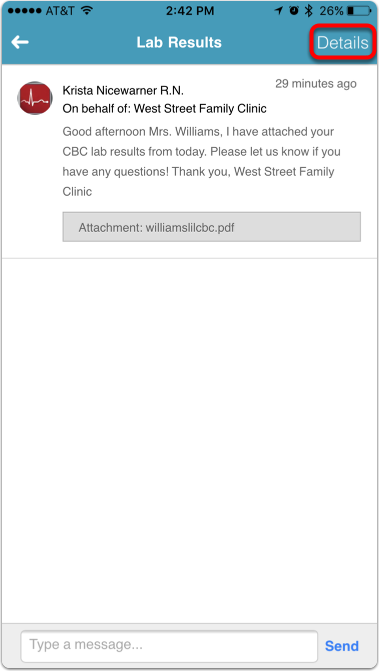 See instructions for adding an attachment below. Enter the contents of your Message. 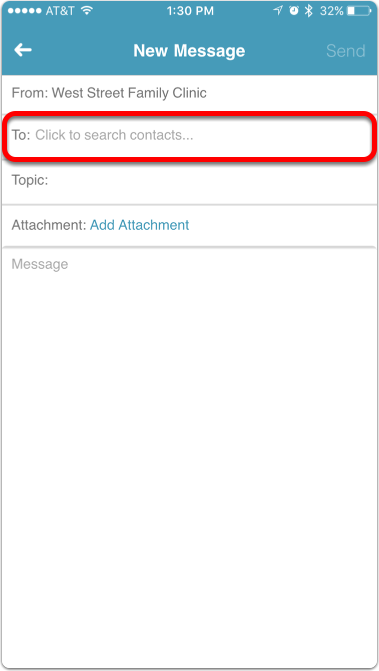 After clicking on Add Attachment, you will be given several options for including an attachment on your conversation. Photo Library: Attach a photo that is saved to the Photo Library on your device. 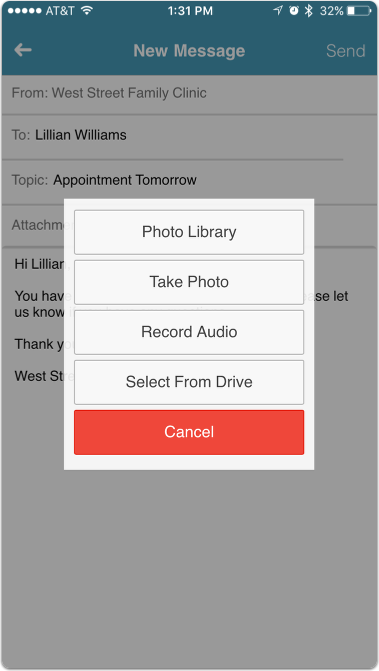 Take Photo: Access your device camera to take a new photo and attach it to the conversation. Record Audio: Access the microphone on your device to attach an audio recording to the conversation. 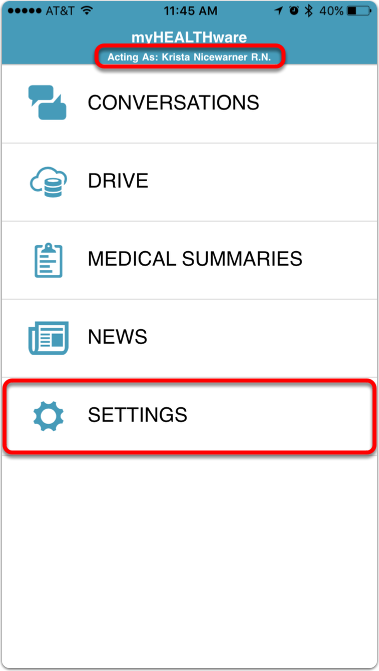 Select from Drive: Access your myHEALTHware Drive storage folders to include a saved document or file as an attachment to the conversation. Click Send to deliver your new conversation. Your message will be sent to your recipients and will be saved in your Conversations inbox as a sent message. Swipe down to refresh your conversations screen. 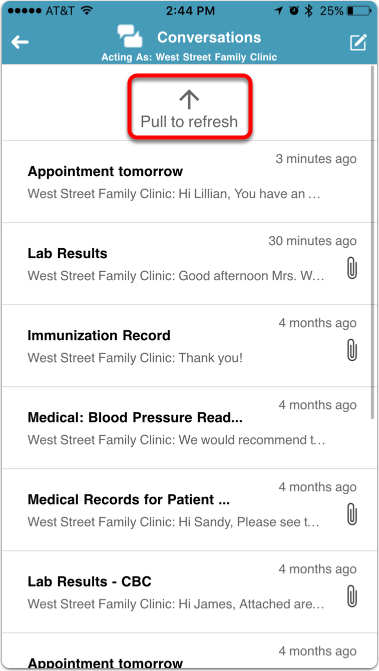 Prev: Download the myHEALTHware Mobile App from an App Store!